LANSING — Three blocks from the State Capitol, the door to The Exchange — a bar that describes itself as “Lansing's premier club for entertainment” — was a busy place at the end of the workday Wednesday. At least three people walked up to the door at about 5 p.m., read the sign posted on it and walked away. Many others, however, walked in. 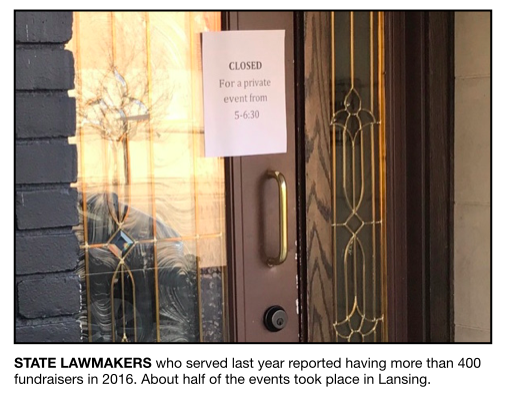 The sign read, “CLOSED for a private event from 5-6:30.” That private event was a reception featuring the highest-ranking member of the Michigan Senate, Majority Leader Arlan Meekhof, a Republican from West Olive. 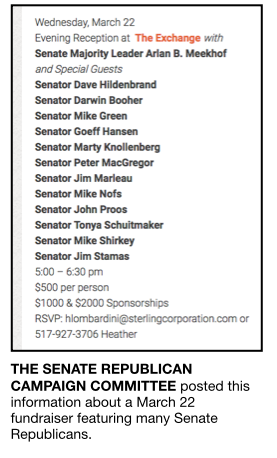 After a day of session and committee hearings, nearly half of the Senate GOP caucus was slated to attend the event as “special guests,” and the price for others was “$500 per person,” according to event information posted online by the Senate Republican Campaign Committee. From the public sidewalk outside, at least seven Senate Republicans, numerous lobbyists and others could be seen walking into The Exchange at about 5 p.m. What happened inside was “private,” as the sign on the door noted. Events like this one are far from unusual in Lansing. State lawmakers who served in the Legislature last year self-reported having at least 414 fundraisers in 2016, according to MCFN’s review of hundreds of campaign finance disclosures. About 46 percent of the events, 192 fundraisers, took place in Lansing on days either the House or the Senate was scheduled to be in session. The numbers include fundraisers for lawmakers' campaigns and for their political action committees. As more money flows into Michigan politics, the numbers show the pressure lawmakers are under to raise cash. They also show that a legislator can be soliciting contributions one minute inside an interest group’s downtown building and then walk a few blocks to the Capitol to vote in session less than an hour later. 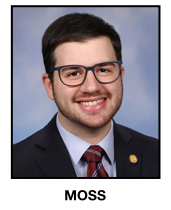 House leadership generally expects House members to hold two fundraisers in Lansing each year, according to multiple sources interviewed for this report. With 110 members, that expectation leads to a busy calendar for lawmakers and for lobbyists who represent their clients at the fundraisers. One lobbyist speaking on the condition of anonymity said it’s not unusual to attend six to eight fundraisers on any given Wednesday at this time of year. The House and Senate are generally in session on Tuesday, Wednesday and Thursday during the first five months of the year. This lobbyist’s high mark for fundraisers was attending 10 fundraisers in a single day. Rep. Jeremy Moss, a Democrat from Southfield, said the endless fundraising at all levels of government is “exhausting.” Moss introduced a bill last session that would have banned lawmakers and other candidates from accepting contributions for their own campaigns in non-election years. The bill didn’t receive a committee hearing. Moss said there’s no correlation between being a good fundraiser and being a good legislator; however, he said there is currently a correlation between being a good fundraiser and getting elected to the Legislature. According to MCFN’s past reporting, the House candidate with the most money on his or her side won about 91 percent of general election races in Michigan in 2016 and about 70 percent of contested primary races. Last year also saw a record amount of spending on lobbying, about $40 million, and it saw the most expensive battle for control of the Michigan House that’s ever been tracked in the state. Moss himself reported having two fundraisers in Lansing in 2016. According to the National Conference of State Legislatures (NCSL), a majority of states place some level of restriction on giving or receiving campaign contributions during the legislative session. Those states tend to have sessions that run for only a few months each year, unlike Michigan’s session, which runs throughout the year. Fifteen states place a prohibition on all contributions during the session. Fourteen place a prohibition on contributions specifically from lobbyists during session, according to NCSL’s findings. At the national level, former U.S. Rep. David Jolly, a Republican from Florida, introduced a proposal in 2016 to ban members of Congress from personally asking for contributions. Because of the amount of time federal lawmakers spend making fundraising calls, the TV news program "60 Minutes" aired an investigation in 2016 that asked, "Are members of Congress becoming telemarketers?" The fundraising on session days in Lansing often starts early. Some days, it begins around sunrise. March 15, a Wednesday when both the House and the Senate were in session, was an example. According to details posted online to promote lawmakers’ fundraisers, there were at least 10 different fundraisers in Lansing on March 15 alone. The day began at 7:30 a.m. at Glazed & Confused, a doughnut shop in downtown Lansing. The shop’s doors feature “no soliciting” signs — apparently not referring to the contribution soliciting that can happen inside. The store was closed for a “private event” on the morning of March 15, according to another sign outside. According to multiple event postings, the Shamrock PAC, a PAC connected to Rep. Laura Cox, a Republican from Livonia, was having a fundraiser inside. Cox is the chair of the House Appropriations Committee, which is currently working to craft a new budget for the state. Later in the day, Rep. Brian Elder, a Democrat from Bay City, held a fundraiser two blocks from the Capitol at the Michigan Beer & Wine Wholesalers Association’s headquarters, according to postings. The event was scheduled to end at 1 p.m., giving lawmakers in attendance enough time to walk to the Capitol, where House session was scheduled to begin at 1:30 p.m.
As the workday concluded, Sen. Margaret O’Brien, a Republican from Portage, held a fundraiser down the street from the Capitol at the Michigan Restaurant Association, according to a posting online. A donor could have given directly to O'Brien's campaign and then driven a few minutes to a fundraiser for a group that will be working to unseat her next year. According to multiple postings online, the Senate Democratic Fund, the main fundraising arm of the Senate Democrats, was scheduled to hold a fundraiser at 5 p.m. March 15 at Lansing Brewing Company. MCFN sent inquiries to the fundraising contacts listed for all of the individual lawmakers listed above. None responded. In total, five House members, four senators and the Senate Democratic Fund were all scheduled to have fundraisers March 15, according to events publicized online. The fundraising totals for the events will show up on campaign finance disclosures filed later this year. According to disclosures, March 15, 2017, wasn’t the only day when 10 legislative fundraisers occurred. In 2016, the day with the most fundraisers disclosed by lawmakers was Sept. 7, a session day that also saw 10 fundraisers in Lansing. Committees connected to eight lawmakers, the Senate Republicans’ main fundraising committee and the House Democrats’ main fundraising committee all reported having fundraisers that day. Across the events, $61,900 was raised, according to the disclosures. Committees connected to all state officeholders serving last year, including statewide officials like Gov. Rick Snyder, reported having 439 fundraisers in 2016. Of those, 414 were put on by committees connected to state legislators in office that year. The events include fundraisers for campaigns and for political action committees directly linked to lawmakers. In 2015, a non-election year, MCFN tracked 315 fundraisers by sitting state officeholders. In 2016 — a year when there were only Michigan House races — the officeholders who reported the most fundraisers weren’t up for election. Attorney General Bill Schuette, a Republican who is term-limited, reported having 16 fundraisers last year. Many believe Schuette is preparing for a run for governor in 2018. Schuette reported events all over Michigan and beyond. He also had events in Colorado, Washington, D.C, and Texas. He reported raising $335,382 at the 16 events. The lawmaker who reported the most fundraisers was Sen. Wayne Schmidt, a Republican from Traverse City who also wasn’t up for election in 2016. Schmidt reported having 12 fundraisers, according to the disclosures. Unlike some lawmakers who had all of their fundraisers in Lansing, only two of Schmidt’s 12 fundraisers occurred in Lansing, according to his filings. Still, Lansing, the place where most interest groups base their political operations, was the most popular location for fundraisers in 2016 by a wide margin. 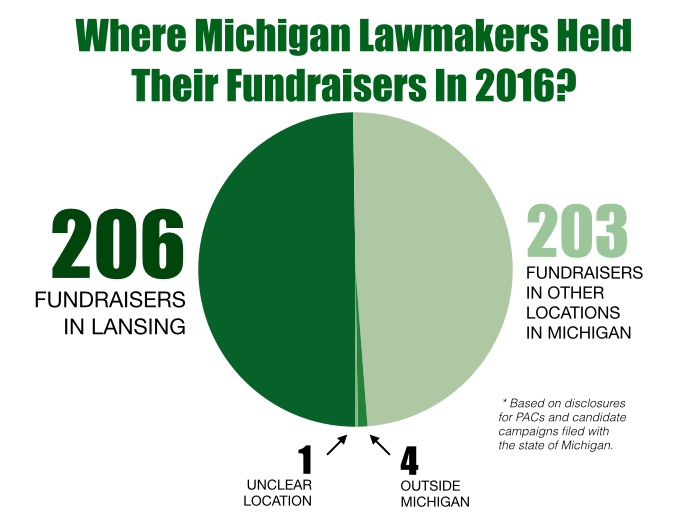 Of the 414 fundraisers for committees connected to specific lawmakers, 206 or 49.7 percent were held in Lansing. Of those in Lansing, 192 occurred on days when either the House or the Senate was in session. Clearly, many state officeholders do a large portion of their fundraising outside their districts, and many of the fundraisers they hold in Lansing occur in buildings that also serve as the headquarters for interest groups or lobbying firms. The Michigan Beer & Wine Wholesalers Association’s headquarters, located just blocks from the Capitol, hosted 19 reported fundraisers for lawmakers in 2016, according to disclosures. The building that houses the Michigan Health & Hospital Association hosted 11 fundraisers, according to disclosures. The location that hosted the most fundraisers in 2016 was Karoub Associates’ “Governors Room.” Karoub Associates is a multi-client lobbying firm. 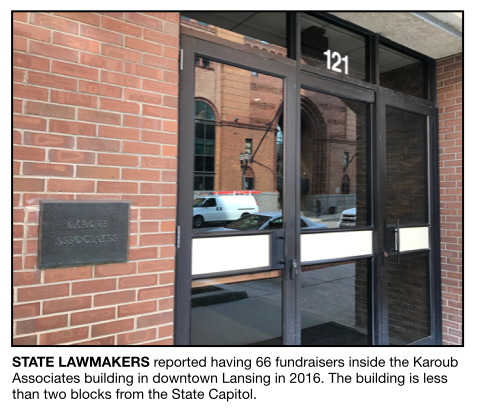 The Karoub building in downtown Lansing was the scene of 66 — or 16 percent — of the total 414 fundraisers lawmakers had in 2016. Off-site activities refer to activities not allowed on state government property, like fundraising. For Moss, some off-site activities like fundraising are consuming too much of lawmakers’ time, time that he says would be better spent on policy making.